Recently, I have been on a quest for new beauty products (especially with the help of this). I’m happy with my current stash but like many women I’m always looking for something new. No matter what my current color code may be, I always keep a staple of items in my purse (eye lash curler, mascara, lip product, etc.) and those items need a home to be carried around. As you know, cosmetic bags come in a range of prices and material. The four I adore are great in size and come at decent price points. I especially love the Felix Rey bag for the over-sized bow and blend of feminine and masculine edge. I also love that it can be a cosmetic bag or convert to a cute clutch (utility is key for me). 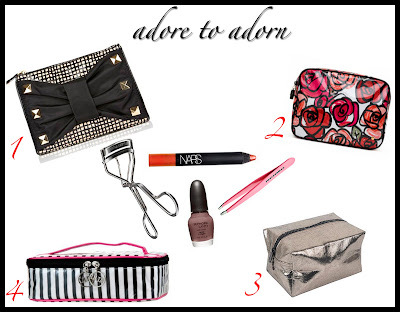 These go-to cosmetic bags can easily adapt in my purse.